"Auto Mains Failure System" is Employed for Auto startup of the DG when the mains supply fails. This is a very common system and is the first step in DG synchronization. Here we will see that what is the basic concept in AMF? What hardware is required to set up AMF and how PLC Programming is done. First of all let us understand what is AMF? Generally, all the major industries/companies/institution have the DG for power backup, but when main power is cut off, someone has to go to start the DG and this takes time and also a man has to be kept for this purpose. So to eliminate this process PLC panel is installed to Auto start the DG when main power fails. Subscribe to Automation-Talk by Email for more such tutorial. When the main power goes, a signal is received to PLC and after 2 minutes DG starts. When the main supply fails signal is received by PLC then after a delay time (can be from 1 to 2 minute), the output for ACB/Contactor of DG is ON and DG starts automatically. Also, the ACB/Contractor of the main transformer if sent OFF command. When main power comes then the signal is again sent to PLC and PLC off the ACB/Contactor of DG and after 2 seconds it on the ACB/Contactor of the main transformer and after 30 seconds it off the DG. DG is sent OFF command a little late so that the load born by DG for a long time can be compensated by running at no load for some time. NOTE:- In 'No' condition, the ACB/Contactor of both DG and Main transformer should be ON. So this is the main concept in DG AMF system. In a simple system, there are generally 4 inputs and 4 outputs. 1. DG ACB/Contactor close feedback. 2. Transformer ACB/Contactor close feedback. For your better understanding below is the sample program. If you have any doubts then just write in comments and we will get back to you. 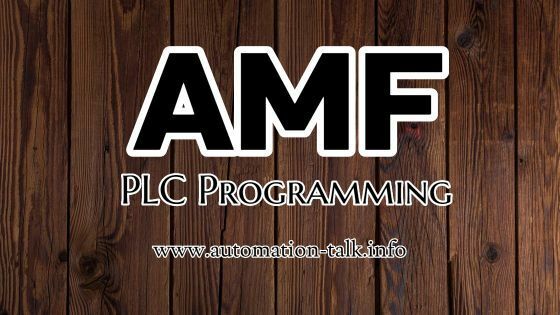 Download the PLC Program for AMF:- Click here to Download. Hope you like this article, if you do comment below and share it on social media. Hope to see you on next article.